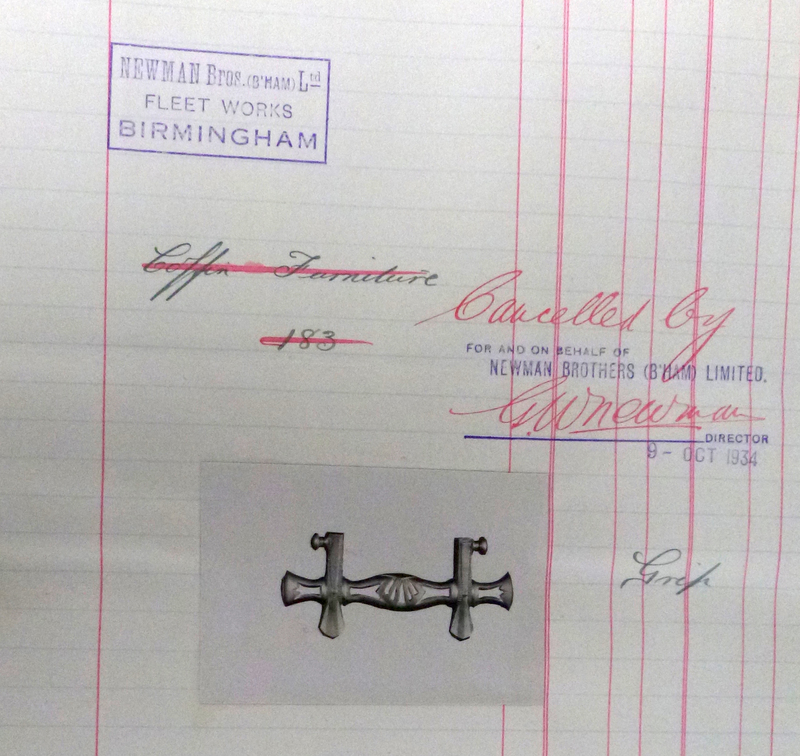 This coffin handle was registered with the Board of Trade in 1934. Interestingly it was cancelled by Newman Brothers’ Director, George Newman the same year (see image below). Companies would cancel Registered Designs to avoid legal action or because a third party had applied to remove the Registered Design. The registration of a design may be declared invalid if it is not new or does not have individual character when compared to a design which has been made available to the public on, or after the date in question, or was registered with the Board of Trade prior to the relevant date. Another possible reason the design was cancelled is because the design was not selling, as Registered Designs were subject to renewal fees every five years. However, this seems unlikely as the design was cancelled in its first year of registration, so this would appear to be a rash decision. 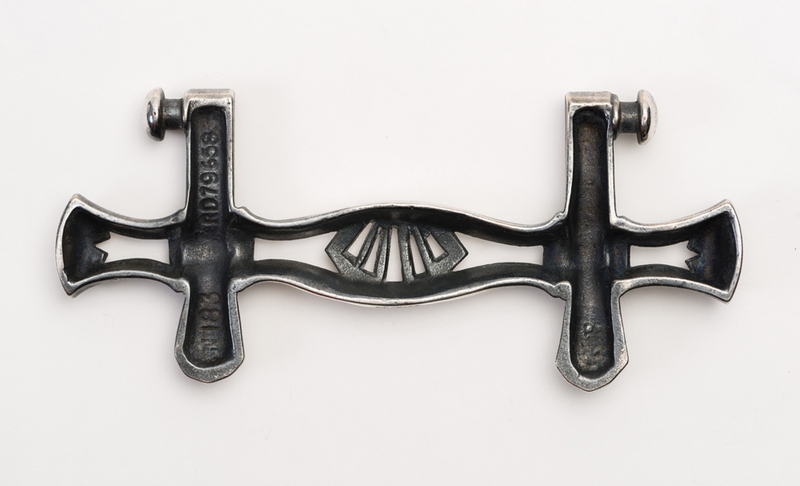 We only have one example of this handle in our collection and we currently do not know how many, if any, of these handles were sold. It would appear that George Newman decided to cancel the registration on account of a petition of cancellation that was brought against Newman Brothers, but this is difficult to prove without the relevant documentation. 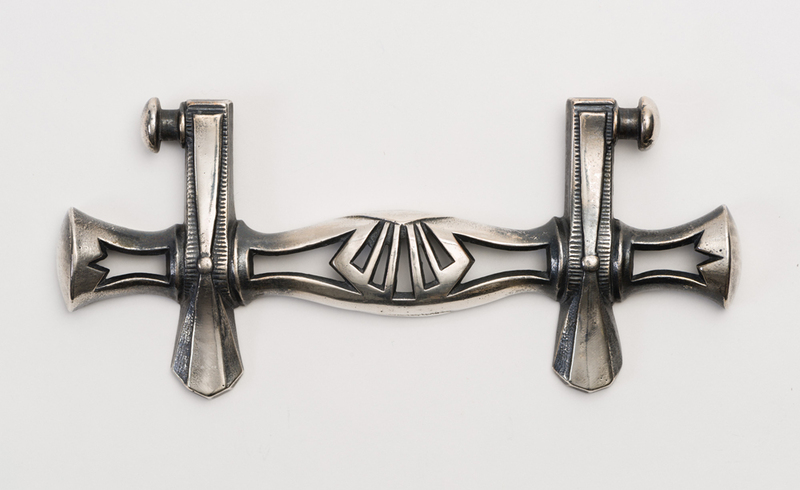 Art Deco kept the nature motifs of its predecessor, Art Nouveau, but left behind its organic shapes and pastel shades for bolder materials and colours such as chrome and black, as illustrated here. The movement began in Europe in the early 20th century, but did not take hold until after the First World War. It remained popular until the outbreak of the Second World War. Its distinguishing features are simple, clean shapes, often with a streamlined look.